In case you’ve been living under a rock, computer-based videoconferencing is quickly on its way to overtaking traditional appliance-based telepresence solutions. For a number of reasons—mainly cost and flexibility, enterprise customers are finding a better value in using desktop videoconferencing programs and deploying them en masse. Manufacturers in the industry are catching up on the technologies necessary to make computer-based UCC applications feasible as a complete replacement for traditional VTC technologies. Vaddio has a line of high-quality USB cameras. Biamp recently released Devio, a platform built for small rooms. Extron has its MediaPort 200, a half-rack unit that converts video and audio signals into a USB connection. QSC recently announced an upcoming update to its Q-SYS platform, integrating PTZ-IP cameras with its existing software-based AEC processing and packaging it into a USB stream, which can be accessed from ports found on its new I/O-USB bridge or touchscreens. USB connectivity of AV solutions has gone from being a niche market or a “nice-to-have” feature to a requirement for many companies. Skype: Still the de facto choice for people that want to “try” video. “Let’s Skype someone in,” they might say. 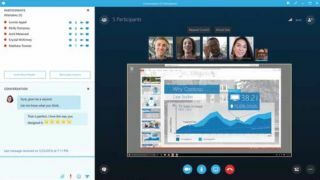 Skype is a great entry-level solution for companies and teams wanting to kick the tires on videoconferencing, or to connect with a remote employee internationally to avoid costly telephone plans. Not designed for, nor intended to be used as, an enterprise solution. Skype for Business, on the features side, offers high-quality video calling, scheduling, soft-phone capabilities, chat, screen share, and whiteboarding capabilities. Skype for Business: Skype for Business is an enterprise solution now, especially as IT departments go. Integration with on-premise or cloud-hosted Microsoft Office 365 is a major feature. Skype for Business will only continue to grow over the next few years as it expands its cloud offering to have everything enterprise voice customers need (IVR, Auto Attendant, etc.). Skype for Business, on the features side, offers high-quality video calling, scheduling, soft-phone capabilities, chat, screen share, and whiteboarding capabilities. Polycom RealPresence Desktop: RealPresence Desktop (RPD) is a features-rich soft-codec platform that integrates with Polycom’s hard-codec endpoints natively. For those heavily entrenched in appliance-based conferencing, RPD offers familiar features, such as address books, included for not only users, but hardware endpoints. Google Hangouts: I know what you’re thinking—how can Hangouts be considered when Skype can’t? You’re not wrong, but Hangouts integrates seamlessly with Google Apps ecosystems (email, calendaring, Docs, etc.) as well as the Chrome for Meetings platform (Chomebox all-in-one solutions). Still not quite enterprise ready, but if you’re a Google house already, it’s a viable option before investing in another piece of software. Somewhat features-lite, Google suffers from video quality issues at times, regardless of network connections. Zoom: Zoom is rapidly gaining popularity. A featuresrich UCC platform with included content sharing and white-boarding, it offers users with a large amount of functionality with different pricing tiers/models. Zoom integrates with legacy systems, allowing standards-based calling solutions to dial into Zoom meetings. Zoom integration into other business applications (email, AD, calendar, etc.) is perhaps the one weak point for an otherwise robust software solution. Cisc The announced expansion of the Spark platform at Enterprise Connect signaled a heavy investment into computer-based conferencing by the hardware codec giant. And with the purchase of Acano, Cisco is passable now, but will soon be an enterprise force. BlueJeans: A cloud bridging service providing interoperability between H.323 systems, Microsoft Lync/Skype for Business, Hangouts, and more, with browser plugins to launch calls directly from your web browser on any computer, as well as desktop clients for Mac and Windows, which offer basic video calling features: audio, video, and content. This certainly isn’t an exhaustive list. There are many capable products for video calling that have been left off: Adobe Connect, GoToMeeting, WebEx, and LifeSize Cloud round out the “enterprise solutions” category, and it seems daily there’s a handful of new “consumer solutions” in the space. So grab your favorite professional-grade peripherals and empower your customers to have plug’n’play conferencing capabilities, and kiss costly appliance-based systems goodbye. Mike Brandes is an AV and IT professional that has held positions both as an end user/tech manager, as well as in AV manufacturing.